The first countrywide population surveys in Great Britain (Scotland, England, and Wales) were taken between 1801 and 1831 and were simply a head count with a little extra information recorded about employment. From 1841 the administration was put in the hands of the Registrar General and the Superintendant Registrars, who were responsible for the registration of births, marriages and deaths. Local men were appointed as ‘enumerators’ and they recorded detailed, if sometimes inaccurate, information about everyone living in the parish. From then on, censuses were taken every ten years. 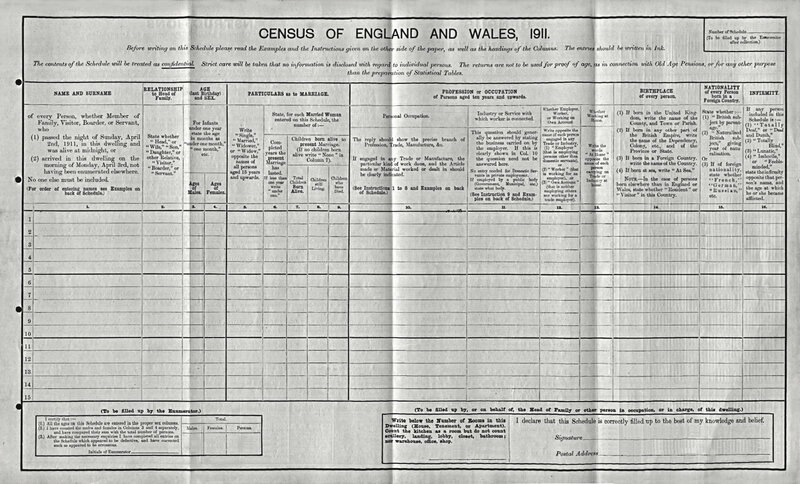 The Census Acts of 1800 and later 1920 provide the legal framework for conducting all censuses in Great Britain. Each householder was given a census schedule to complete giving details of the household and the enumerator then collected the schedules and copied them into Census Enumerator’s Books. In the earlier records, the end of each building is shown with two slashes // and the end of each household in a building is shown with one slash /. Although the original pre-1911 census schedules were destroyed many years ago, the books were kept and are now held at The National Archives in Kew. The books were filmed in 1970 to protect the originals from increasing wear and tear.